Well there are quite a few. First thing that hit me when I gleefully played with it when introduced was it's inability to make an image smaller than raster size. Why is that an issue? What do you do if you want to take a UHD image in a HD project and go from infinitely small to 1:1 pixel size ? Impossible with Frame Flex. What happen if you want to push into a UHD image in a HD project and shift it off the screen edge? Impossible with just Frame Flex. There are so many instances where you are forced to use both Frame Flex AND the 3D Warp. Unless I am wrong, this is causing two rasterizations when only one should be required, meaning unneeded image degradation. These are just a couple of examples of the bad design of Frame Flex. There really should be only one tool for resizing / repositioning an image. What we have now is a series of bandaids one on another. Avid owned DS well before Frame Flex was released. DS's DVE was res independent. It is not like there was no knowledge within Avid about what a useful tool should be. I do not mean to offend any one but it feels as if Frame Flex was designed as Resolution Independence For Idiots. Just automatically resize an image to the current project raster and call it done. As limited as it is, Premiere's implementation much more useful than Avids. And yes, I reaize that changing Frame Flex would be hard. My client's do not care if the problems I am presented are hard. They just want solutions. I feel the same about Frame Flex. As GPU have become the real source of power, would be nice to see our favorite editor enter the 21st century! It would be a useful addition to have at least a stabilizer and tracker incorporated into framefrex. I know that can be done in a higher resolution project first, exported and then brought into the lower resolution project using frameflex but that is potentially a lot of extra time and disc space. And how about a Linux version. Lightworks, Resolve and others do it as it allows to be closer to the core power of the machine. Some good thoughts here and also some ideas that I fundamentally disagree with. If these get added to the next voting cycle we will have an opportunity to voice our opinions. Playback that doesn't stop whenever you click something on screen... but we have been asking for this since I joined this community so let's be realistic... not going to happen. Title tool - due mid 2017, not even on display at IBC in Sept - and when it does arrive... really not holding out much hope. Leverage those Cuda cores in the vid card... another oldie so, yup, unlikely. 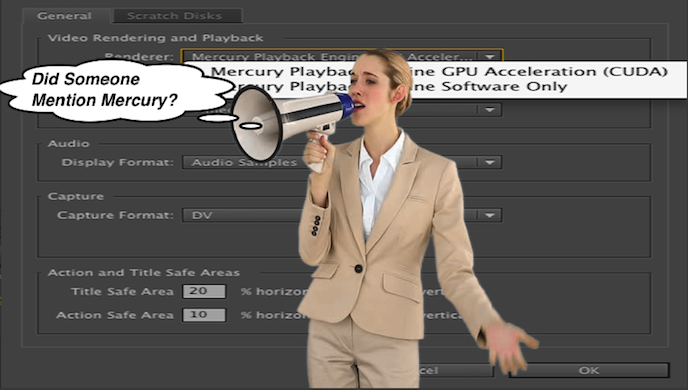 Sorry to sound cynical but we have all been asking for these things for years... sub frame audio editing on the timeline, proper FX handling, secondary CC, tabbed timelines, matchframe to subclip, dockable windows, workspaces we can read (those dialogues that blend into the background), projects that dont care what format they are - you decide that on the creation of each timeline. I really hope 2018 brings something startling to the table that make us sit up - but I fear it wont and with every year we move our projects more and more onto the Adobe platform. The reason we want it, is to be more productive— for instance, to do some necessary clip renaming/bin cleanup or to look for and find something, get it ready, while the timeline is playing in a screening for a client or producer. The software needs to be agile, do more things at once... all in the foreground. Absolutely need a high-contrast “Craig’s List” interface view that’s legible, legible, legible! It has to do with an editor’s eyesight and real customization vs. what we have now which seems like a homogenized safe “look”, more a symphony of subtle grey tones and pastels...well, we understand all that design, but remember there are MANY. different editors of all ages and as a group, need to SEE whether those too-tiny colored Settings tick-marks are on or off! I simply want to be able to modify the Markers window more easily and perhaps even be able to save layouts much the same as I can with Bins. I work on value-added content for Disney features. We wind up with like 6 versions of the film in various degrees of completion thruought the post process. We always have to manually log the changes and update our cuts with the latest feature when we get a new version in. It would be cool to load the new feature into the source side and the old feature timeline in the record monitor and run a comparison that leaves markers where the features change. It would likely have to stop every time a change was noticed but I think it could be a useful feature and someone FAR smarter than I could figure a way to make that more feasible. Maybe start from the end and work its way forward? Not sure but I feel like there's something there. Also I would love the ability to export items with an embeded alpha. Subframe audio editing would be such a step forward and long, long overdue (as is a new title tool). Not sure how you'd reflect it in passing audio to pro tools, but I don't really care as it would make such a difference all the rest of the time. And knowing how long it's taken Avid to achieve some of the updates I've wanted, in some cases many years, I reckon it will happen eventually. Many of us cannot use "stereo tracks" because of the format change in timelines and massive conversion necessary for exsiting music libraries. Minimum: add a gang/group button between audio mixer faders that lets us gang adjacent faders together. Even better: let us turn faders from 2 tracks or more into one fader. AND: add an option to treat "dual mono" clips as "stereo tracks" without them actually being one. So when we load a "dual mono" clip into the source window we get only one fader. Make it possible to patch into stereo tracks without having to convert it. All great points folks, well, even with all these limitations, i still prefer editing on Avid than Premiere. Solid media management for sure. Yes, Avid lacks what Adobe has - amazing titler, easy ability to import and create graphics. etc. etc. I just feel that Avid's strength is in the editing tools. Basically what I do now is AAF export from timeline and then bring it into Premiere. Then do all my color correction, add titles and graphics in Premiere and finally export using AME to H264 4K 60P for YouTube output. One very interesting thing I noticed. If you have a DNxHR project and have DNxHR media, if you do a digital cut, you do NOT need to render any basic effects such as cross resolves! You CANT do this in Premiere without dropping frames. Just FYI. Smoother Playback, drag and drop clips onto timeline I don't know any other software that makes you wait and wait and wait, then on top of that having red lines and playback that's horrific. Being able to export various formats, using mulltiple frame rates in the same timeline like every other NLE out there, syncing audio within project, did I mention smoother playback? IF Resolve had avids timeline and made it easier to slip the edit that would be rock solid NLE. Avid blows at the end of the day.